In many industries, workers cannot do their jobs effectively if they’re tied to their desk. However, it’s also expected that they have same level of communication accessibility as if they’re sitting next to their office phone. This push and pull for workers who don’t have desk-centric jobs can be frustrating, can cause tensions among co-workers, and can impact interactions with customers. For example, a warehouse manager may need the phone mobility to assess product inventory. A front desk worker at a hotel may need to step away from the desk to address a guest issue. The sales clerk at your retail store may be arranging a product display and be far from the phone when it rings. The restaurant manager who is on their feet may risk missing that call from their supplier when they’re not at their desk. Additionally, office workers may face similar challenges in the flexibility of stepping away from their desk while preserving accessibility. For example, consider a staff meeting where no one is available to field phone calls. Telecommuting workers who step away from their home office for a lunch break may miss a call if their office phone rings. A real estate agent greeting clients in the lobby risks losing a sale if not near a desk to answer the phone. Ooma has added a new cordless IP phone that provides you with the capabilities of a desk phone, even when you’re not sitting at a desk. With the Yealink W56H cordless phone, your range of telephone accessibility will expand from the few feet of your phone cord to about 164 feet indoors and nearly 1,000 feet in outdoor spaces. That means that when you’re indoors, your reach would be more than two and a half bowling lanes. When outdoors, your range would be more than three football fields. So, whether you work in a garden center or on a construction site, these Yealink phones let you continue to be accessible, even when you’re far from your desk. The Yealink W56H (and Yealink W60P bundle of handset and base unit) is compatible with your award-winning Ooma Office phone service. To get started, the Yealink W60P package includes both a Yealink W60B base unit and one Yealink W56H handset. 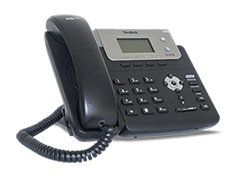 Because each base unit has a capacity for up to seven additional handsets, you can add on multiple Yealink W56H phones to get the ultimate configuration for your business. The Yealink W60B base unit that’s a part of the Yealink W60P cordless phone package has the capacity to accommodate eight compatible Yealink handsets. It uses wireless DECT 6.0 technology to support eight concurrent calls with HD audio quality. The base unit can be desk- or wall-mounted, and the product includes a power supply and Ethernet cable. Whether your Yealink W56H handset is a part of a package or purchased separately as an add-on device, these powerful cordless phones have a wide range and a long battery life. The Li-ion battery can power your phone for 30 hours of talk time or 400 hours of standby time before it needs to be recharged. Plus, the battery can be recharged either with the phone’s charging stand or by using the device’s USB port. There’s a 2.4-inch color display to provide you access to your Ooma phone tools such as caller ID, call waiting, extension dialing, and more. Keep in mind that with the smaller-sized device, you won’t have as many shortcut buttons as you have with a desk phone such as the Yealink T27G. However, this small-profile cordless phone uses an on-screen user interface combined with code commands for access to calling features. Plus, there’s also a belt clip so you can keep your hands free while carrying the phone with you. 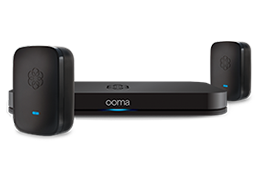 Learn more about how the Yealink W60P and Yealink W56H can help you make the most of your Ooma phone service. Mark Maxwell is Director of Product Management for Ooma’s SMB products and services and is responsible for creating sophisticated, yet easy-to-use products for our small & medium business customers. Prior to joining Ooma, Mark led Product for Military.com- the nation’s largest online military & veteran community. Mark’s entire career has been focused on delivering complex technology in a simple, approachable manner to both consumers and small business customers. In the past, Mark’s products have won Webby Awards, JD Edwards Customer satisfaction awards, and even People Magazine’s Tech Pick of the Year. Mark is a graduate of Middlebury College in Middlebury, VT.